135 Marlborough is located on the north side of Marlborough, between Clarendon and Dartmouth, with 133 Marlborough to the east and 137 Marlborough (317 Dartmouth) to the west. 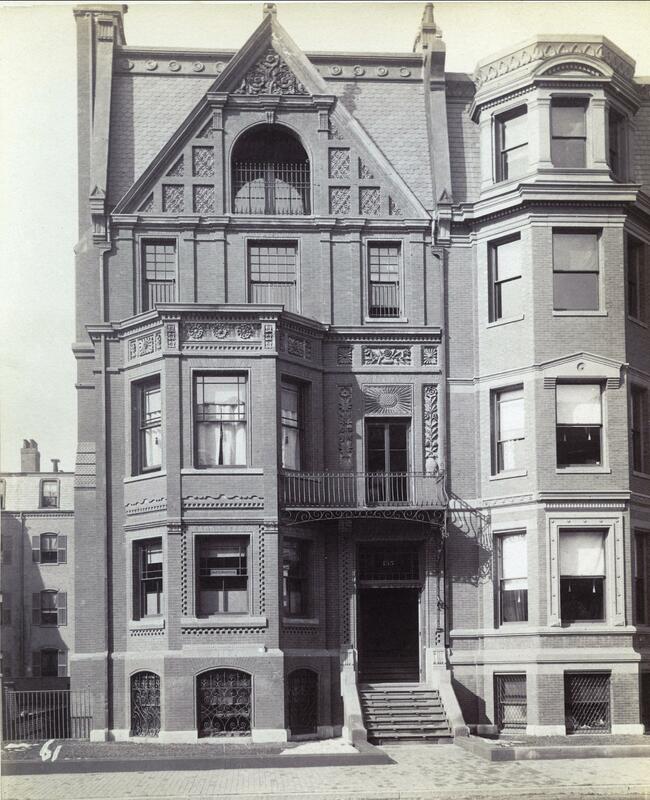 135 Marlborough was designed by Cabot and Chandler, architects, and built in 1880 by Weston & Shepard and B. D. Whitcomb, builders, for Henry Lee, Jr., on land he purchased from the Commonwealth of Massachusetts on November 18, 1879. He is shown as the owner on the original building permit application, dated December 23, 1879. 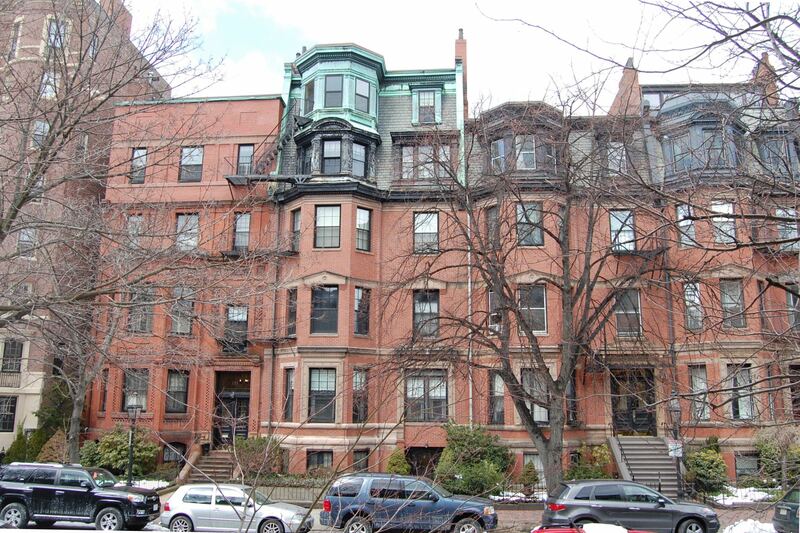 Click here for an index to the deeds for 135 Marlborough. Henry Lee, Jr., was a partner in the investment banking firm of Lee, Higginson and Company. He and his wife, Elizabeth Perkins (Cabot) Lee, lived in Brookline. 135 Marlborough became the home of the Lees’ son-in-law and daughter, Dr. Frederick Cheever Shattuck and Elizabeth Perkins (Lee) Shattuck. They previously had lived at 22 Brimmer. Frederick Shattuck was a physician and would later become a professor of clinical medicine at Harvard Medical School. On December 8, 1882, Henry Lee transferred 135 Marlborough to his daughter. In January of 1907, Elizabeth Shattuck purchased 319 Dartmouth, around the corner from their home, which she leased to others. 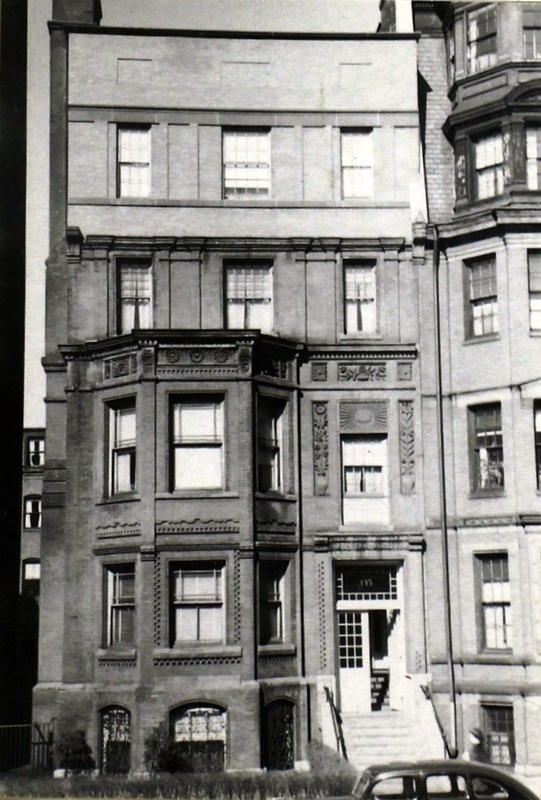 The Shattucks continued to live at 135 Marlborough until his death in January of 1929. They also maintained homes in Dark Harbor, Maine, and in Brookline. The Shattucks unmarried twin sons, George Cheever Shattuck, a physician, and Henry Lee Shattuck, a lawyer, lived with them. After Frederick Shattuck’s death, Elizabeth Shattuck and her two sons moved to Brookline. Elizabeth Shattuck died in April of 1931. 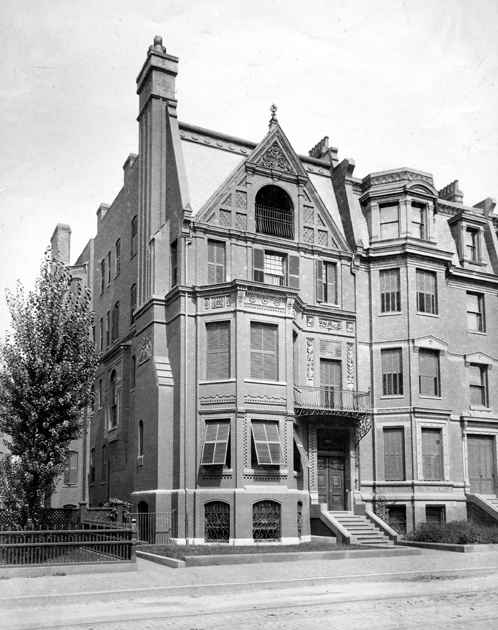 135 Marlborough became the property of a trust established in her will for the benefit of her daughter, Elizabeth Perkins (Shattuck) Bigelow, the wife of oceanographer and zoologist Henry Bryant Bigelow, and her son-in-law, Edward Pierson Richardson, the widower of Clara Lee (Shattuck) Richardson. 135 Marlborough was not listed in the 1930-1937 Blue Books and was shown as vacant in the 1934 and 1936 City Directories. On January 15, 1937, 135 Marlborough was purchased from the trustees for Elizabeth Bigelow and Edward Richardson by Benjamin George Brooker, a certified public accountant and real estate dealer. He lived at 433 Beacon (which he owned and remodeled into an apartment building) and then in Newton. In January of 1937, he applied for (and subsequently received) permission to remodel 135 Marlborough and convert it from a single-family dwelling into a ten-unit apartment house. The remodeling was designed by architect Herman L. Feer and included replacing a sloped roof, large tudor gable, and baronial chimney with a simple, flat-sided top. The brick ornamentation on the lower floors was retained. By 1947, Benjamin Brooker had also acquired 133 Marlborough, where he moved to one of the apartments. In October of 1948, he applied for (and received) permission to cut through doors between the two buildings. 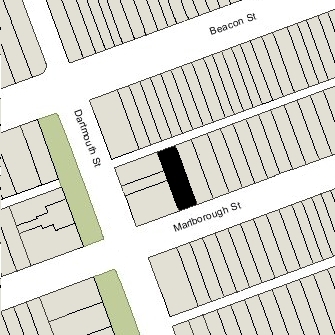 The permit application for 135 Marlborough indicates that the front entrance would be lowered; however, this change was made at 133 Marlborough instead, and the entrance to 135 Marlborough was not altered. Plans for combining the buildings and lowering the front entrance of 135 Marlborough, designed by architectural engineer Mendal Waters, are included in the City of Boston Blueprints Collection in the Boston Public Library’s Arts Department (reference BIN R-91). On July 17, 1950, he transferred 133-135 Marlborough to himself as trustee of the Mass. Realty Trust. 133-135 Marlborough changed hands, and on February 1, 1962, were acquired by the Stephen Realty Corporation (Alton G. Cherney, treasurer). 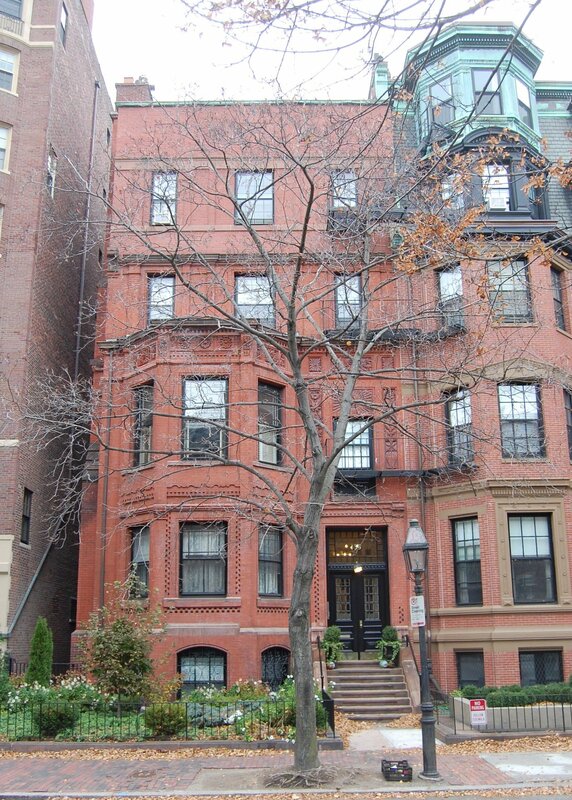 On October 9, 1980, 133-135 Beacon were acquired from the Stephen Realty Corporation by Laurence J. Shapiro and Arthur Gauthier, trustees of the 133-135 Marlborough Street Associates Trust. On February 27, 1981, they converted the properties into 13 condominium units at 133 Marlborough and 11 condominium units at 135 Marlborough, the 133-135 Marlborough Street Condominium.